A Village Singer first appeared in Harper's New Monthly Magazine in July, 1889. "The most formidable mountain height of the world, self-distrust and timidity, arose before her, but her nerves were braced for its ascent." The trees were in full leaf, a heavy south wind was blowing, and there was a loud murmur among the new leaves. The people noticed it, for it was the first time that year that the trees had so murmured in the wind. The spring had come with a rush during the last few days. The murmur of the trees sounded loud in the village church, where the people sat waiting for the service to begin. The windows were open; it was a very warm Sunday for May. The church was already filled with this soft sylvan music — the tender harmony of the leaves and the south wind, and the sweet, desultory whistles of birds — when the choir arose and began to sing. In the center of the row of women singers stood Alma Way. All the people stared at her, and turned their ears critically. She was the new leading soprano. Candace Whitcomb, the old one, who had sung in the choir for forty years, had lately been given her dismissal. The audience considered that her voice had grown too cracked and uncertain on the upper notes. There had been much complaint, and after long deliberation the church officers had made known their decision as mildly as possible to the old singer. She had sung for the last time the Sunday before, and Alma Way had been engaged to take her place. With the exception of the organist, the leading soprano was the only paid musician in the large choir. The salary was very modest; still, the village people considered it large for a young woman. Alma was from the adjoining village of East Derby; she had quite a local reputation as a singer. Now she fixed her large solemn blue eyes; her long, delicate face, which had been pretty, turned paler; the blue flowers on her bonnet trembled; her little thin gloved hands, clutching the singing book, shook perceptibly; but she sang out bravely. The most formidable mountain height of the world, self-distrust and timidity, arose before her, but her nerves were braced for its ascent. In the midst of the hymn she had a solo; her voice rang out piercingly sweet; the people nodded admiringly at one another; but suddenly there was a stir; all the faces turned toward the windows on the south side of the church. Above the din of the wind and the birds, above Alma Way's sweetly straining tones, arose another female voice, singing another hymn to another tune. “It's her,” the women whispered to each other; they were half aghast, half smiling. Candace Whitcomb's cottage stood close to the south side of the church. She was playing on her parlor organ, and singing, to drown out the voice of her rival. 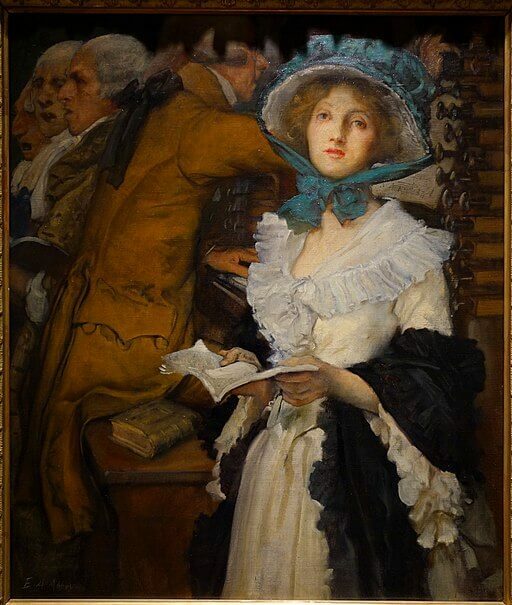 Alma caught her breath; she almost stopped; the hymn book waved like a fan; then she went on. But the long husky drone of the parlor organ and the shrill clamor of the other voice seemed louder than anything else. When the hymn was finished, Alma sat down. She felt faint; the woman next her slipped a peppermint into her hand. “It ain't worth minding,” she whispered, vigorously. Alma tried to smile; down in the audience a young man was watching her with a kind of fierce pity. In the last hymn Alma had another solo. Again the parlor organ droned above the carefully delicate accompaniment of the church organ, and again Candace Whitcomb's voice clamored forth in another tune. After the benediction, the other singers pressed around Alma. She did not say much in return for their expressions of indignation and sympathy. She wiped her eyes furtively once or twice, and tried to smile. William Emmons, the choir leader, elderly, stout, and smooth-faced, stood over her and raised his voice. He was the old musical dignitary of the village, the leader of the choral club and the singing schools. “A most outrageous proceeding,” he said. People had coupled his name with Candace Whitcomb's. The old bachelor tenor and old maiden soprano had been wont to walk together to her home next door after the Saturday-night rehearsals, and they had sung duets to the parlor organ. People had watched sharply her old face, on which the blushes of youth sat pitifully, when William Emmons entered the singing seats. They wondered if he would ever ask her to marry him. And now he said further to Alma Way that Candace Whitcomb's voice had failed utterly of late, that she sang shockingly, and ought to have had sense enough to know it. When Alma went down into the audience room, in the midst of the chattering singers, who seemed to have descended, like birds, from song flights to chirps, the minister approached her. He had been waiting to speak to her. He was a steady-faced, fleshy old man, who had preached from that one pulpit over forty years. He told Alma, in his slow way, how much he regretted the annoyance to which she had been subjected, and intimated that he would endeavor to prevent a recurrence of it. “Miss Whitcomb — must be — reasoned with,” said he; he had a slight hesitation of speech, not an impediment. It was as if his thoughts did not slide readily into his words, although both were present. He walked down the aisle with Alma, and bade her good morning when he saw Wilson Ford waiting for her in the doorway. Everybody knew that Wilson Ford and Alma were lovers; they had been for the last ten years. Alma colored softly and made a little imperceptible motion with her head; her silk dress and the lace on her mantle fluttered, but she did not speak. Neither did Wilson, although they had not met before that day. They did not look at each other's faces — they seemed to see each other without that — and they walked along side by side. “Well, there's one thing about it, if she does that thing again this afternoon, I'll go in there and break that old organ up into kindling wood.” Wilson set his mouth hard and shook his head again. Other people going home from church were very near Wilson and Alma. She spoke softly that they might not hear; he did not lower his voice in the least. Presently Alma stopped before a gate. “What are you stopping here for?” asked Wilson. He did not tell Alma of the pugnacious spirit with which his mother had received the announcement of her coming, and how she had stayed at home to prepare the dinner and make a parade of her hard work and her injury. Wilson's mother was the reason why he did not marry Alma. He would not take his wife home to live with her, and was unable to support separate establishments. Alma was willing enough to be married and put up with Wilson's mother, but she did not complain of his decision. Her delicate blond features grew sharper, and her blue eyes more hollow. She had had a certain fine prettiness, but now she was losing it and beginning to look old, and there was a prim, angular, old-maiden carriage about her narrow shoulders. Wilson never noticed it, and never thought of Alma as not possessed of eternal youth, or capable of losing or regretting it. “Come along, Alma,” said he; and she followed meekly after him down the street. Soon after they passed Candace Whitcomb's house, the minister went up the front walk and rang the bell. The pale profile at the window had never stirred as he opened the gate and came up the walk. However, the door was promptly opened, in response to his ring. “Good morning, Miss Whitcomb,” said the minister. “Good morning.” Candace gave a sweeping toss of her head as she spoke. There was a fierce upward curl to her thin nostrils and her lips, as if she scented an adversary. Her black eyes had two tiny cold sparks of fury in them, like an enraged bird's. She did not ask the minister to enter, but he stepped lumberingly into the entry, and she retreated rather than led the way into her little parlor. He settled into the great rocking-chair and wiped his face. Candace sat down again in her old place by the window. She was a tall woman, but very slender and full of pliable motions, like a blade of grass. “It's a — very pleasant day,” said the minister. Candace made no reply. She sat still, with her head drooping. The wind stirred the looped lace curtains; a tall rose tree outside the window waved; soft shadows floated through the room. Candace's parlor organ stood in front of an open window that faced the church; on the corner was a pitcher with a bunch of white lilacs. The whole room was scented with them. Presently the minister looked over at them and sniffed pleasantly. Candace did not speak. Every line of her slender figure looked flexible, but it was a flexibility more resistant than rigor. The minister looked at her. He filled up the great rocking-chair; his arms in his shiny black coat sleeves rested squarely and comfortably upon the haircloth arms of the chair. The minister looked at her. The minister looked. Candace's feet were resting on a large red-plush photograph album. “Makes a nice footstool, don't it?” said she. The minister looked at the album, then at her; there was a slowly gathering alarm in his face; he began to think she was losing her reason. Candace had her eyes full upon him now, and her head up. She laughed, and her laugh was almost a snarl. “Yes; I thought it would make a beautiful footstool,” said she. “I've been wantin' one for some time.” Her tone was full of vicious irony. “I know what you're a-goin' to say, Mr. Pollard, an' now I'm goin' to have my say; I'm a-goin' to speak. I want to know what you think of folks that pretend to be Christians treatin' anybody the way they've treated me? Here I've sung in those singin' seats forty year. I ain't never missed a Sunday, except when I've been sick, an' I've gone an' sung a good many times when I'd better been in bed, an' now I'm turned out without a word of warnin'. My voice is jest as good as ever 'twas; there can't anybody say it ain't. It wa'n't ever quite so high pitched as that Way girl's, mebbe; but she flats the whole durin' time. My voice is as good an' high today as it was twenty year ago; an' if it wa'n't, I'd like to know where the Christianity comes in. I'd like to know if it wouldn't be more to the credit of folks in a church to keep an old singer an' an old minister, if they didn't sing an' hold forth quite so smart as they used to, ruther than turn 'em off an' hurt their feelin's. I guess it would be full as much to the glory of God. S'pose the singin' an' the preachin' wa'n't quite so good, what difference would it make? Salvation don't hang on anybody's hittin' a high note, that I ever heard of. Folks are gettin' as high steppin' an' fussy in a meetin' house as they are in a tavern, nowadays. S'pose they should turn you off, Mr. Pollard, come an' give you a photograph album, an' tell you to clear out, how'd you like it? I ain't findin' any fault with your preachin'; it was always good enough to suit me; but it don't stand to reason folks'll be as took up with your sermons as when you was a young man. You can't expect it. S'pose they should turn you out in your old age, an' call in some young bob squirt, how'd you feel? There's William Emmons, too; he's three years older'n I am, if he does lead the choir an' run all the singin' in town. If my voice has gi'en out, it stan's to reason his has. It ain't, though. William Emmons sings jest as well as he ever did. Why don't they turn him out the way they have me, an' give him a photograph album? I dunno' but it would be a good idea to send everybody, as soon as they get a little old an' gone by, an' young folks begin to push, on to some desert island, an' give 'em each a photograph album. Then they can sit down an' look at pictures the rest of their days. Mebbe government'll take it up. “There they come here last week Thursday, all the choir, jest about eight o'clock in the evenin', an' pretended they'd come to give me a nice little surprise. Surprise! h'm! Brought cake an' oranges, an' was jest as nice as they could be, an' I was real tickled. I never had a surprise party before in my life. Jenny Carr she played, an' they wanted me to sing alone, an' I never suspected a thing. I've been mad ever since to think what a fool I was, an' how they must have laughed in their sleeves. “When they'd gone I found this photograph album on the table, all done up as nice as you please, an' directed to Miss Candace Whitcomb from her many friends, an' I opened it, an' there was the letter inside givin' me notice to quit. Mr. Pollard, the minister, sat staring. He did not look at Candace; his eyes were fastened upon a point straight ahead. He had a look of helpless solidity, like a block of granite. This country minister, with his steady, even temperament, treading with heavy precision his one track for over forty years, having nothing new in his life except the new sameness of the seasons, and desiring nothing new, was incapable of understanding a woman like this, who had lived as quietly as he, and all the time held within herself the elements of revolution. He could not account for such violence, such extremes, except in a loss of reason. He had a conviction that Candace was getting beyond herself. He himself was not a typical New Englander; the national elements of character were not pronounced in him. He was aghast and bewildered at this outbreak, which was tropical, and more than tropical, for a New England nature has a floodgate, and the power which it releases is an accumulation. Candace Whitcomb had been a quiet woman, so delicately resolute that the quality had been scarcely noticed in her, and her ambition had been unsuspected. Now the resolution and the ambition appeared raging over her whole self. Candace had had an inborn reverence for clergymen. She had always treated Mr. Pollard with the utmost deference. Indeed, her manner toward all men had been marked by a certain delicate stiffness and dignity. Now she was talking to the old minister with the homely freedom with which she might have addressed a female gossip over the back fence. He could not say much in return. He did not feel competent to make headway against any such tide of passion; all he could do was to let it beat against him. He made a few expostulations, which increased Candace's vehemence; he expressed his regret over the whole affair, and suggested that they should kneel and ask the guidance of the Lord in the matter, that she might be led to see it all in a different light. When the bell had stopped tolling, and all the people entered the church, Candace went over to her organ and seated herself. She arranged a singing book before her, and sat still, waiting. Her thin, colorless neck and temples were full of beating pulses; her black eyes were bright and eager; she leaned stiffly over toward the music rack, to hear better. When the church organ sounded out she straightened herself; her long skinny fingers pressed her own organ keys with nervous energy. She worked the pedals with all her strength; all her slender body was in motion. When the first notes of Alma's solo began, Candace sang. She had really possessed a fine voice, and it was wonderful how little she had lost it. Straining her throat with jealous fury, her notes were still for the main part true. Her voice filled the whole room; she sang with wonderful fire and expression. That, at least, mild little Alma Way could never emulate. She was full of steadfastness and unquestioning constancy, but there were in her no smouldering fires of ambition and resolution. Music was not to her what it had been to her older rival. To this obscure woman, kept relentlessly by circumstances in a narrow track, singing in the village choir had been as much as Italy was to Napoleon — and now on her island of exile she was still showing fight. After the church service was done, Candace left the organ and went over to her old chair by the window. Her knees felt weak and shook under her. She sat down and leaned back her head. There were red spots on her cheeks. Pretty soon she heard a quick slam of her gate and an impetuous tread on the gravel walk. She looked up, and there was her nephew, Wilson Ford, hurrying up to the door. She cringed a little; then she settled herself more firmly in her chair. Wilson came into the room with a rush. He left the door open, and the wind slammed it to after him. “Aunt Candace, where are you?” he called out, in a loud voice. She made no reply. He looked around fiercely, and his eyes seemed to pounce upon her. “Wilson Ford!” said Candace, in a voice that was almost a scream. Wilson could not get another word from his aunt. His indignation had not in the least cooled. Her threat of disinheriting him did not cow him at all; he had too much rough independence, and indeed his aunt Candace's house had always been too much of an air castle for him to contemplate seriously. Wilson, with his burly frame and his headlong common sense, could have little to do with air castles, had he been hard enough to build them over graves. Still he had not admitted that he never could marry Alma. All his hopes were based upon a rise in his own fortunes, not by some sudden convulsion, but by his own long and steady labor. Sometime, he thought, he should have saved enough for the two homes. He went out of his aunt's house still storming. She arose after the door had shut behind him, and got out into the kitchen. She thought that she would start a fire and make a cup of tea. She had not eaten anything all day. She put some kindling wood into the stove and touched a match to it; then she went back to the sitting room, and settled down again into the chair by the window. The fire in the kitchen stove roared, and the light wood was soon burned out. She thought no more about it. She had not put on the teakettle. Her head ached, and once in a while she shivered. She sat at the window while the afternoon waned and the dusk came on. At seven o'clock the meeting bell rang again, and the people flocked by. This time she did not stir. She had shut her parlor organ. She did not need to outsing her rival this evening; there was only congregational singing at the Sunday-night prayer meeting. She sat still until it was nearly time for meeting to be done; her head ached harder and harder, and she shivered more. Finally she arose. “Guess I'll go to bed,” she muttered. She went about the house, bent over and shaking, to lock the doors. She stood a minute in the back door, looking over the fields to the woods. There was a red light over there. “The woods are on fire,” said Candace. She watched with a dull interest the flames roll up, withering and destroying the tender green spring foliage. The air was full of smoke, although the fire was half a mile away. Candace locked the door and went in. The trees with their delicate garlands of new leaves, with the new nests of song birds, might fall; she was in the roar of an intenser fire; the growths of all her springs and the delicate wontedness of her whole life was going down in it. Candace went to bed in her little room off the parlor, but she could not sleep. She lay awake all night. In the morning she crawled to the door and hailed a little boy who was passing. She bade him go for the doctor as quickly as he could, then to Mrs. Ford's, and ask her to come over. She held on to the door while she was talking. The boy stood staring wonderingly at her. The spring wind fanned her face. She had drawn on a dress skirt and put her shawl over her shoulders, and her gray hair was blowing over her red cheeks. She shut the door and went back to her bed. She never arose from it again. The doctor and Mrs. Ford came and looked after her, and she lived a week. Nobody but herself thought until the very last that she would die; the doctor called her illness merely a light run of fever; she had her senses fully. But Candace gave up at the first. “It's my last sickness,” she said to Mrs. Ford that morning when she first entered; and Mrs. Ford had laughed at the notion; but the sick woman held to it. She did not seem to suffer much physical pain; she only grew weaker and weaker, but she was distressed mentally. She did not talk much, but her eyes followed everybody with an agonized expression. On Wednesday William Emmons came to inquire for her. Candace heard him out in the parlor. She tried to raise herself on one elbow that she might listen better to his voice. “William Emmons come in to ask how you was,” Mrs. Ford said, after he was gone. “On the table,” replied her sister, hesitatingly. “Perhaps it was your sickness coming on,” said the minister, soothingly. After the minister had gone, Candace still appeared unhappy. Her pitiful eyes followed her sister everywhere with the mechanical persistency of a portrait. “What is it you want, Candace?” Mrs. Ford said at last. She had nursed her sister faithfully, but once in a while her impatience showed itself. Mrs. Ford stared. “Well,” said she. The meeting was now in session. The windows were all open, for it was another warm Sunday. Candace lay listening to the music when it began, and a look of peace came over her face. Her sister had smoothed her hair back and put on a clean cap. The white curtain in the bedroom window waved in the wind like a white sail. Candace almost felt as if she were better, but the thought of death seemed easy. Mrs. Ford at the parlor window watched for the meeting to be out. When the people appeared, she ran down the walk and waited for Alma and Wilson. When they came she told them what Candace wanted, and they all went in together. “Here's Alma an' Wilson, Candace,” said Mrs. Ford, leading them to the bedroom door. Candace smiled. “Come in,” she said, feebly. And Alma and Wilson entered and stood beside the bed. Candace continued to look at them, the smile straining her lips. “Don't, Aunt Candace.” Tears were running over Wilson's cheeks, and Alma's delicate face was all of a quiver. “I thought — maybe — Alma'd be willin' to — sing for me,” said Candace. “What do you want me to sing?” Alma asked, in a trembling voice. Alma, standing there beside Wilson, began to sing. At first she could hardly control her voice; then she sang sweetly and clearly. Candace lay and listened. Her face had a holy and radiant expression. When Alma stopped singing it did not disappear, but she looked up and spoke, and it was like a secondary glimpse of the old shape of a forest tree through the smoke and flame of the transfiguring fire the instant before it falls. “You flatted a little on — soul,” said Candace. Add A Village Singer to your own personal library.